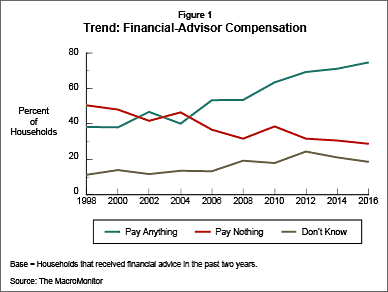 How Do Investors Prefer to Pay for Financial Advice? The specter of the Department of Labor’s Fiduciary Rule for retirement accounts and defending investment advice in state courts have driven firms to spend millions of dollars to review compensation plans that might be construed as conflicted. But for all the money that they spent in preparation, financial institutions have spent much less to understand how investors feel about how they pay for advice. For insight into how households make financial decisions, we turn to the Consumer Financial Decisions Group’s MacroMonitor, the largest and longest-running comprehensive financial-services database used in measuring, analyzing, and interpreting consumer attitudes, behaviors, and motivations continuously since 1978. Kehrer Bielan partners with CFD to provide the consumer perspective to banks and credit unions and their product and service partners looking to improve the delivery of investment services. Even though more households than previously realize they're paying for financial advice, their thirst for advice has not been quenched. For that trend to continue upward, whether or not the Fiduciary Rule is adopted, modified, or scratched, depends on the investor's perception that advice is valuable. If the industry is going to thrive in a world where assets increasingly flow into low-cost index mutual funds, ETFs, and algorithm driven digital advisors, the perceived value of advice has paramount importance. It may make economic sense to segment the delivery of advice by the assets an investor has under management (AUM). However, it does not necessarily follow that any individual investor prefers the type of advisor compensation, frequency of interaction, or channel(s) of communication the firm bundles for each segment, making understanding your clients’ preferences more important than ever. 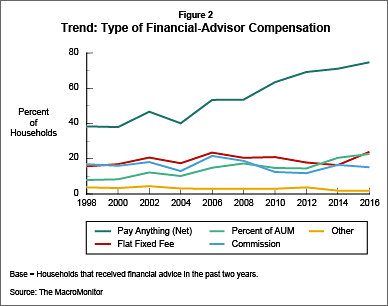 The two-decade trend reveals that since 1998, the proportion of advised households that pay commission-based FAs has remained static; flat-fixed-fee payments have gradually increased from 16 percent in 1998 to 24 percent currently; investors compensating their FAs using a percentage of AUM have increased in number from 8 percent to 23 percent. What distinguishes investors who pay for advice differently? They have different financial attitudes: the degree to which they follow their FAs' advice, whether they would follow their FA to a different firm, or whether they would recommend their FA to their colleagues, friends, or family, and the frequency and how they prefer to communicate. Institutions interested in learning how these types of investors differ should contact us for more information.